Hello again!!! 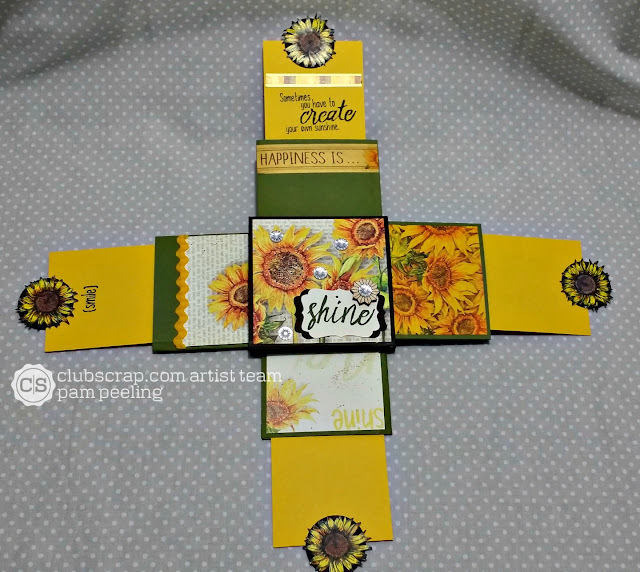 Welcome to the Club Scrap August Blog Hop! If you've come from Hetty's blog then you're following right along! 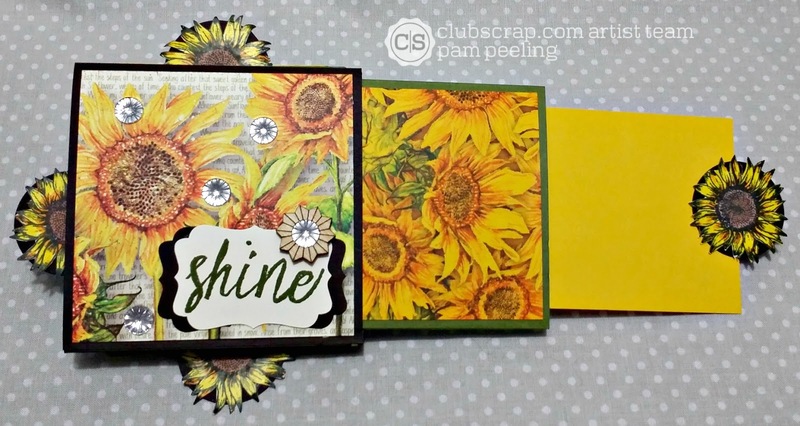 The Club Scrap kit for August is Sunflowers. WOW this was a great kit! I love all the printed papers and great colors. I decided to make a mini album using the Triple Tier Slider card concept. I made one of these cards for a previous card challenge for the Boardwalk kit and loved it! I decided to alter it a bit and create a stacked mini album. Cut 8 pieces 1/2" x 3"
Cut the slits in the base from 1/2" to 3 1/2"
Cut the slits in the 2nd tier from 1/4" to 3 3/4"
So I basically made 4 of these cards and glued them all together one on top of the other! Here's the "cards" with the tiers pulled out, before I decorated and stacked them. 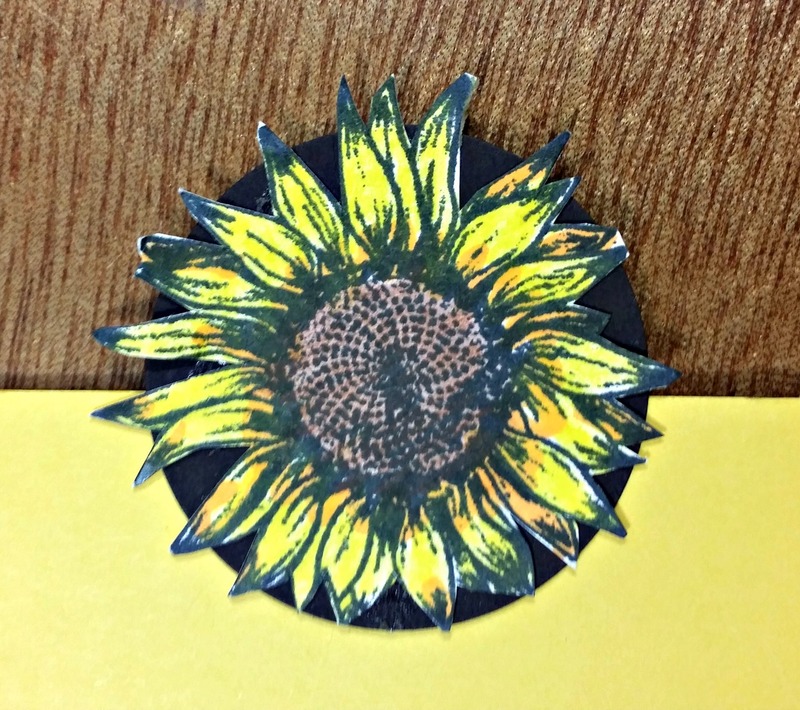 For the "pulls" I used one of the flower images on the Art Nouveau unmounted rubber stamps. It was a flower part of a bigger image but it was the right size. 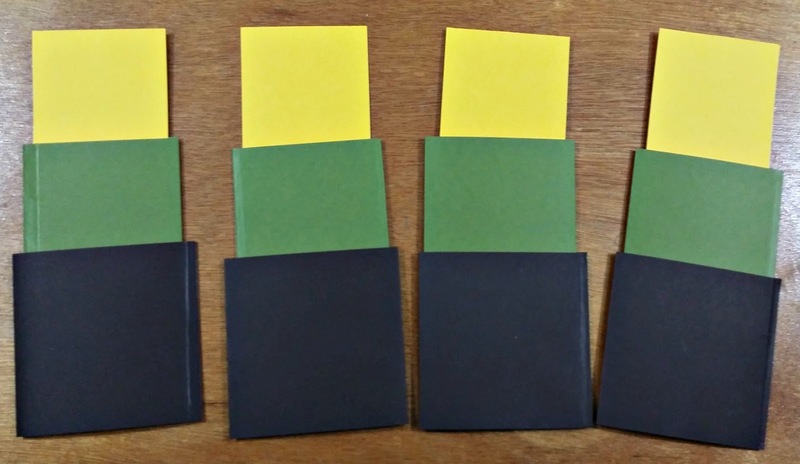 I colored them with colored pencils and fussy cut all four. Yes I said all four! That was kind of a pain but I really liked the look. 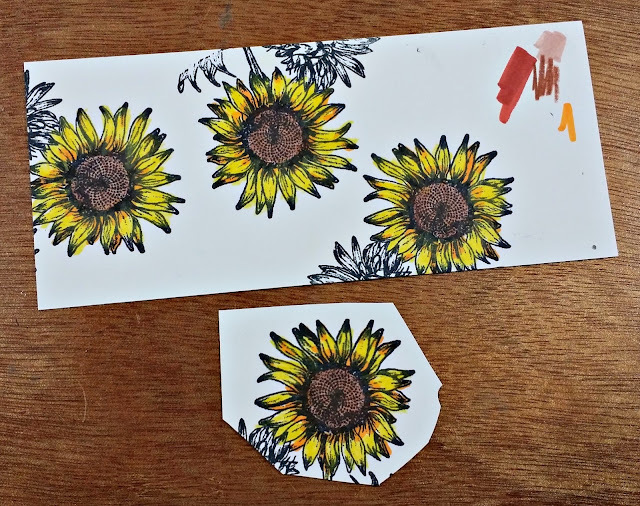 I backed each flower with a 1 1/2" circle punched out of the dark brown that came with the kit. Then I adhered it to the edge of the top tier with Scor-tape. Then I stacked all the decorated "cards" on top of each other adhering them with Scor-tape. I placed them so the tiers pulled out each on a different side. Here it is with all the tiers pulled out all the way around. 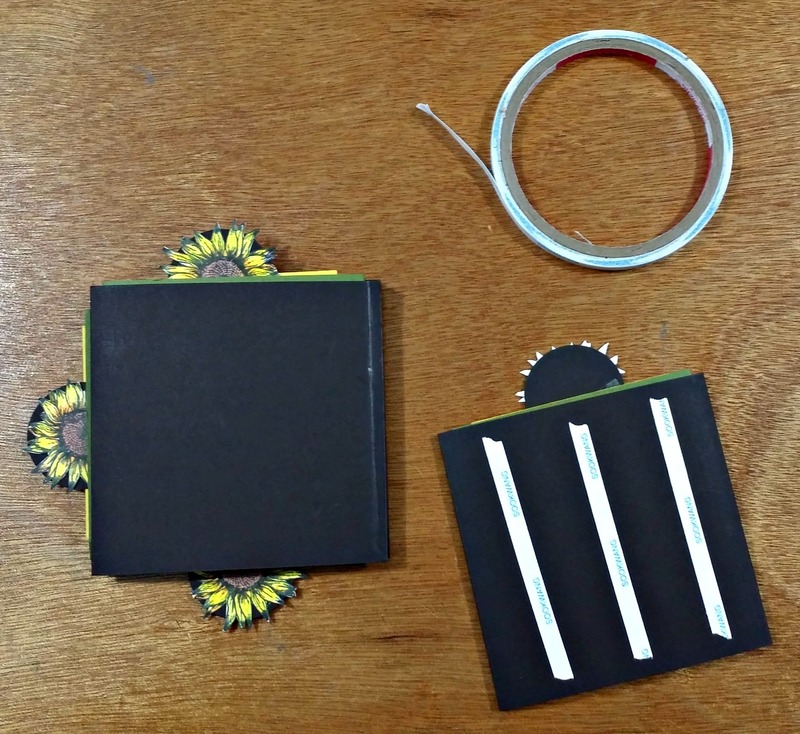 There's room for small photos and journaling. I decorated each tier a little differently. So keep hopping and see what everyone else made! Your next stop is Tricia! Wowzers, this is some great project and I love it with this kit! I have to come back and study how you do this! How adorable is that? What a great idea! I have fussy-cut my share of that sunflower image, as well. Normally I stand when I craft, but for that one, I had to sit down. ;) Kudos for doing all four! Awesome project and very well made. What a clever album concept! In my personal crafting I really try to avoid fussy-cutting at all cost (I lack the patience). But as you've demonstrated in this case, it's totally worth the effort. Well done! Cute album idea! Thanks for sharing and have a great day! Pam, this is a really cool card!! Super cute! A fabulous mini album! 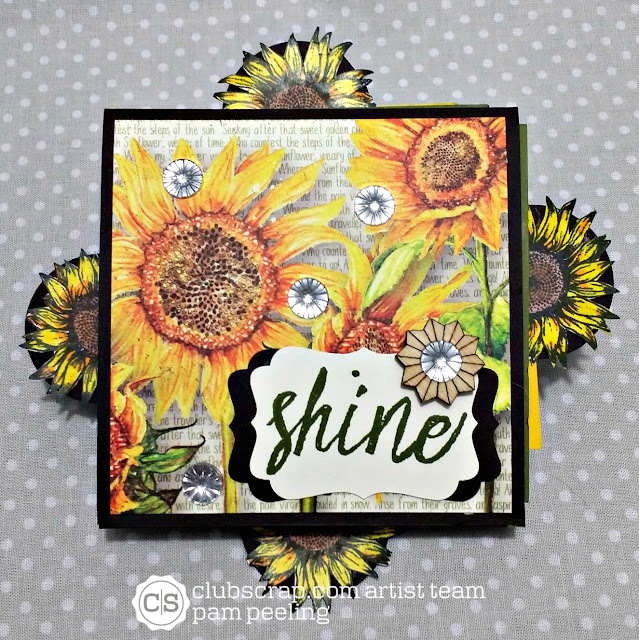 The Cutout sunflowers are an adorable embellishment on this great project! It's really a clever mini album with all the pockets and pullouts and all, adorable. Interactive cards! What an intriguing project! You've added so much detail, I could entertain myself for a while playing with this! Fun project! Such a special card. I've made a tier card, but your card certainly has gone the extra mile. Thank you for sharing the directions!! Wow! You rocked this mini album!